That’s what a portion of the respondents are doing – I mean heck, endorsements are given every day on the site, so some people must think positive things about them. 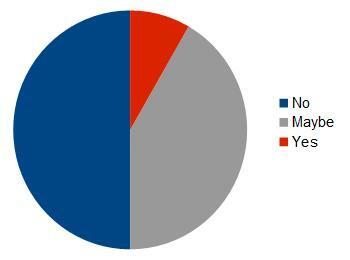 I’ve gone to a pie chart because – well – November is “Pie Month” – look it up! Do the new LinkedIn Skill Endorsements mean anything? If endorsements come with no cost – in dollars, concentration, or time, what can they be worth? Yes, some visitor to this particular profile took a few seconds to click on the endorse button. Does it really mean the individual can be well described with that adjective? Is that enough information to change a decision to go into business with that person? Does it matter if someone doesn’t receive any of those votes of popularity? So there’s been yet another freakishly odd storm. And if I sidestep the suggestion for the moment that man has anything to do with the general rise in world-wide temperature, I’d like to ask – do you think the change in temperature has anything to do with recent weather patterns? Really – do you think they’re related?